Over the last few years, it has become increasingly difficult for marketers in higher education to convert prospective students to enrolled students. Rising tuition costs, questions about ROI and measurement of outcomes, increased competition and instant access to information due to the rise of social and digital media are just a few of the challenges facing higher education institutions. Yet, given all this, higher education degrees are still in high demand. This spring, LinkedIn embarked on research to examine how the higher education marketer can respond to these new challenges while meeting the persistent demand. We wanted to understand how digital and social media has empowered prospects throughout the decision process, and help marketers re-align their strategies to influence prospects at key touch points throughout the decision journey. For the answers, LinkedIn reached out to MBA/Masters students and alumni, as well as MBA/Masters intenders (defined as Bachelors degree holders interested in furthering their education). More than 1,627 LinkedIn members in the U.S. were asked: how has the higher education decision journey changed in the digital age? Who are the key influencers in the higher education decision process? What types of content are prospects most interested in at each stage of the decision journey? 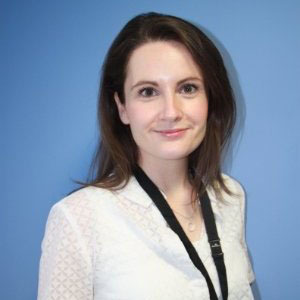 And, how can schools better connect with prospects using relevant messages that resonate with their key motivations? The short list is exclusive and critical to make – The average short list consists of only 3 schools. 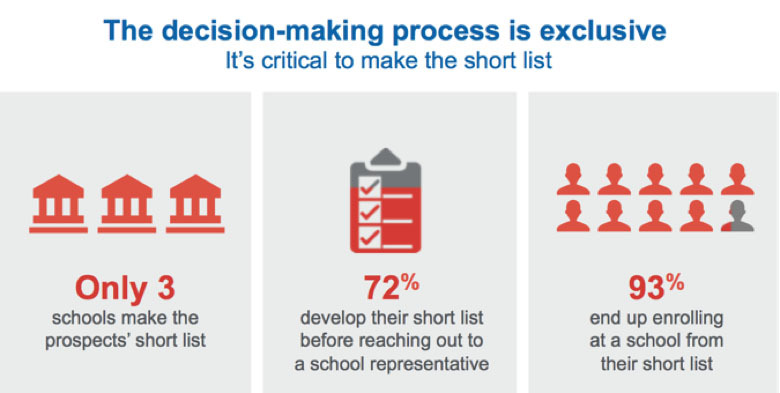 Approximately 72% of students will have developed their short list before they reach out to a school representative. 93% of respondents ended up enrolling in a school from their short list. Peer groups and professional networks are a significant influence – Family, friends and peers are one of the most influential sources of information -- 2nd only to an institution’s website. Professional networks are 3x more influential than personal social networks. Millennials are driven by a different mindset than GenXers – Both have a strong passion for learning, but for very different reasons. Millennials are driven more by increase in salary, while GenXers are more concerned with personal growth. Prospects seek specific content at each decision stage – Marketers should target the right prospects with relevant content at the respective decision stage in order to improve the quality of their conversions. As we look closer at the key findings, the research shows that nearly three out of four prospects develop their short list of schools before they even contact a school. In other words, prospects are far along in the decision process by the time they speak to your enrollment advisors. Given that 93% of respondents told us that they end up enrolling at a school from their short list, marketers have to be well ahead in the process to influence the decision. The best way to do this is through always-on content marketing. Although earning an advanced degree is a very personal choice, the new findings show the decision Grads are turning to their friends, family, and peers when considering further education. What’s even more interesting though, is that professional networks are 3 times more influential than personal networks. Marketers need to think about how they can impact these wider circles of influence, by having a presence on their professional networks and building trust through relevant content. Millennials and GenXers have different reasons for going back to school, which could influence how you attract and retain them as potential students. Both Millennials and GenXers have a strong passion for learning, but for very different reasons. Millennials are at the beginning or earlier stages of their career and are more driven by money and are willing to move industry to boost their pay. GenXers on the other hand are more settled and confident in their careers and have satisfied the lower level basic salary needs – think Maslow’s Hierarchy of Needs. As such, GenXers are more concerned with self-actualization, self-fulfilment and personal growth. Savvy marketers know that prospects seek different types of content depending on where they are in the decision journey. Our research showed that by tailoring prospect communication with the right content at the right time, schools can remain top of mind with students to have the best chance of making the all-important short list. Information on courses and degree programs are relevant across all 3 stages, making that type of content table stakes across the board. 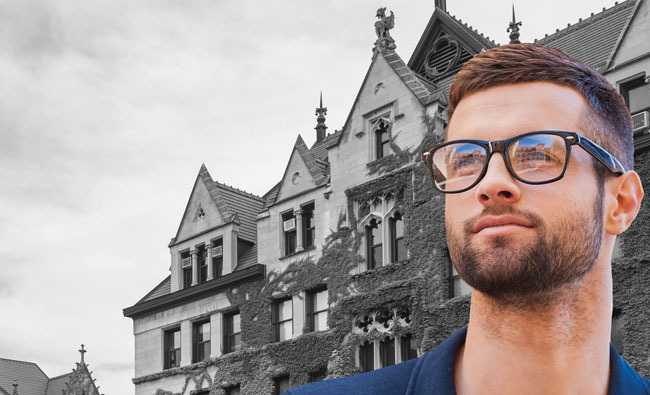 Higher Education marketing is more complicated than ever, and it’s time to overcome the new challenges or fall behind. The new eBook from LinkedIn, Connecting with Today’s Prospective Students: How Higher Education Decisions are Made in the Digital Age, examines the key finding of our latest student journey research and shares implications for today’s higher education marketers. Download the eBook today.